❈ In Setup>Display, the radio pop up screen will be displayed when [Mode Pop up] is turned . When the pop up screen is displayed, use the TUNE knob or keys 1 ~ 6 to select the desired mode. Changes to CD, USB, iPod, AUX, My Music, BT Audio modes. Each time the key is pressed, the mode is changed in order of CD, USB, iPod, AUX, My Music, BT Audio modes. ❈ In Setup>Display, the media pop up screen will be displayed when [Mode Pop up] is turned . When the pop up screen is displayed, use the TUNE knob or keys 1 ~ 5 to select the desired mode. Radio Mode : Automatically searches for broadcast frequencies. 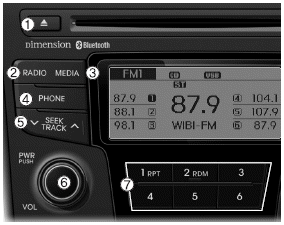 In the Radio, Media, Setup, and Menu pop up screen, the number menu is selected. ❈ Audio operation is maintained and only the screen will be turned Off. In the screen Off state, press any key to turn the screen On again. - Press and hold the key (over 0.8 seconds): Previews the broadcasts saved in Preset ~ for 5 seconds each. ❈ Press the key again to continue listening to the current frequency. ❈ XM Radio does not support the Preset scan feature. ❈ Press the key again to continue listening to the current song (file). • Displays menus for the current mode. ❈ May differ depending on the selected audio. ❈ When the desired song is displayed, press the knob to play the song.